I voted for Hillary Clinton last November. Not because I liked her program. I was voting against Donald Trump. He is crude, sleazy and a terrible narcissist. I preferred John Kasich, Governor of Ohio, in the Republican Primary. But he didn’t make it. 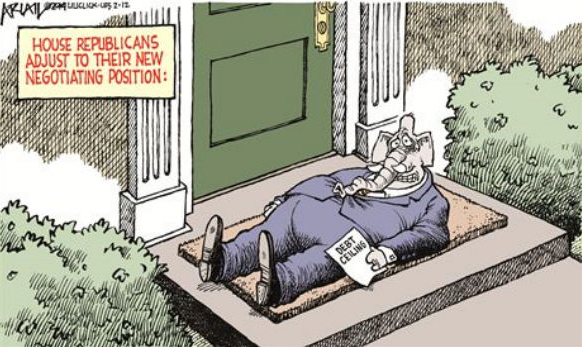 I voted for Mitt Romney in 2012 but he didn’t make it either. Slow economic growth, averaging just 2% per year since the end of the Great Recession in June 2009. Faster growth means a tighter labor market which in turn means more workers and higher wages. This in turn means less inequality. Furthermore, it is the United States’ dominant economic strength which assures world peace and stability. The Chinese economy, now half the size of ours, will catch us eventually. But stronger U.S. growth will delay this and enable us to cope with it better when it happens. Massive Debt. The public debt of $14 trillion (on which we pay interest) is now 77% of GDP, (https://itdoesnotaddup.com/2017/01/31/trump-needs-a-wall-of-fiscal-discipline/) the highest since the end of WWII and steadily getting worse. With current low interest rates the debt is now essentially “free” money. But what will happen when interest rates return to normal historical levels? At this point interest payments on the debt will rise precipitously and become a huge drain on the budget. We can’t prevent this from happening but we can lessen the impact by acting now. Will the Trump Administration take these two problems seriously? For sure on economic growth. His re-election chances in four years depend largely on the fortunes of his base of blue-collar workers. His appointments at Treasury (Mnuchin), HHS (Price), and EPA (Pruitt) all support the tax reform and deregulation needed to get this done. I am confident that Trump will avoid a disastrous trade war. The debt. This is trickier because Trump has said he won’t touch Social Security or Medicare. My optimism is based on the fact that the Debt Ceiling will be re-imposed on March 16 at its level on that date. This will give Congress just a few months to raise the ceiling to a higher level. 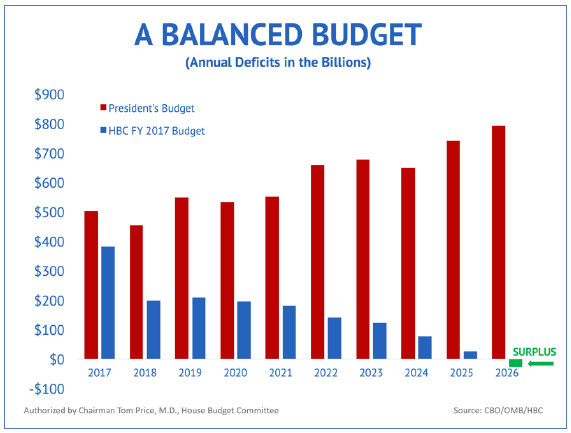 It is likely that the many fiscal conservatives in the House will insist, in return, for some sort of spending restraint such as a ten-year plan to balance the budget. Conclusion. We’re not out of the woods yet. But there is a clear path showing the way forward. 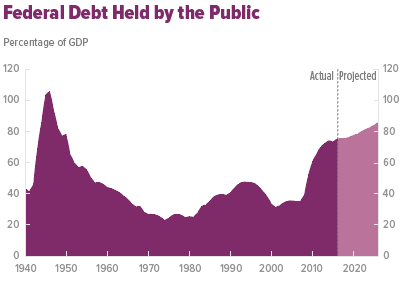 Our public debt (on which we pay interest) is now at 74% of GDP, the highest it has been since the end of WWII. 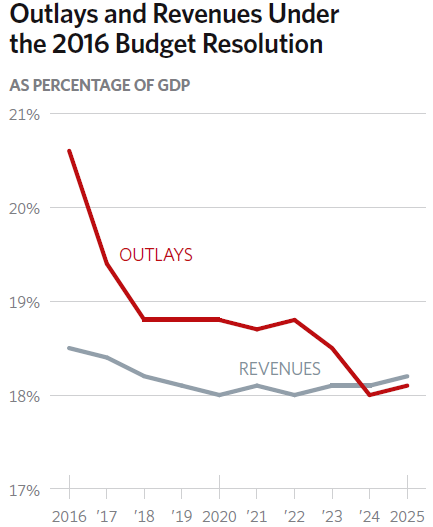 Democrats want to raise taxes and increase spending; Republicans want to cut taxes and decrease spending. The only way to satisfy both parties simultaneously is to run huge annual deficits which is exactly what has happened ever since the end of the Great Recession in 2009. 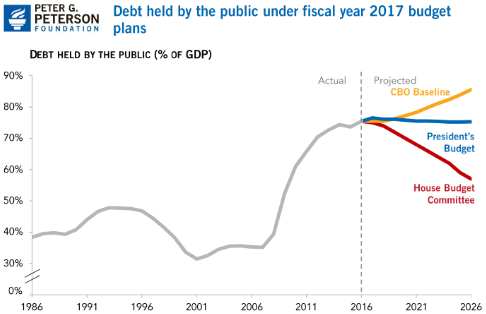 The President’s budget would hold the public debt at about 75% of GDP over the next ten years by both raising taxes and increasing spending on a variety of programs. The House Budget Committee plan keeps revenues steady at 18.2% of GDP over the next ten years and achieves a balanced budget after ten years. By 2026 the debt held by the public would fall to 57% of GDP from its current 74% level. Here are two significantly different ten year budget plans. What is likely to happen is a complete standoff without any bipartisan agreement. This means that no appropriations bills for individual government agencies will be enacted by October 1. Finally, as usual, an omnibus spending bill will be put together by Congressional leaders and forced through at the last minute to avoid a government shutdown. A BBA would make both sides compromise and come up with an overall plan. It would likely contain both spending restraint and new sources of revenue. Then the various Congressional committees would hammer out the spending details for individual agencies and department. It would be a far more sensible and transparent process than the way things are done now. Congress and the President have to be forced to act in such a reasonable manner. A Balance Budget Amendment is perhaps the only way to make this happen. Speeding up economic growth in order to create more jobs and better paying jobs, especially for middle- and lower-income workers whose wages have been stagnant for the past 15 years. Getting our large and rapidly growing national debt under control by shrinking annual deficit spending. 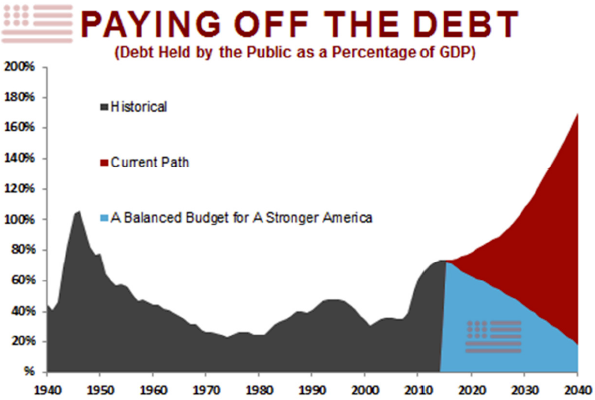 This will put our debt on a downward path as a percentage of GDP. Growing the economy with tax reform. The best way to spur investment and business expansion is with the lowest possible tax rates on owners and investors. Broad-based tax reform, with lower tax rates for all, paid for (i.e. in a revenue neutral way) by closing loopholes and shrinking deductions, will accomplish this. The 64% of taxpayers who do not itemize deductions will increase their income with tax rate cuts. Lower tax rates for the affluent will be offset by shrinking deductions and closing loopholes. The corporate tax rate should also be cut to internationally competitive levels, again paid for by drastically shrinking, if not totally eliminating, all deductions. This way all corporations (including GE!) would pay the same tax rate. And American companies would have much less incentive to move overseas. Reducing our national debt. We have got to drastically shrink our annual deficits (now running about $500 billion per year) in order to put our national debt on a downward course, as a percentage of GDP. The House Budget Committee has recently passed a plan to balance the budget within ten years. Not everyone will agree with the details, but at least it’s a starting point. 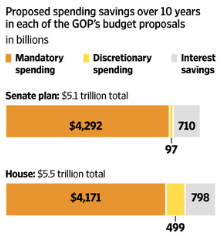 An alternative approach is to adopt a Balanced Budget Amendment to the U.S. Constitution. This would require Congress to make tradeoffs annually between either restraining spending or raising taxes. A BBA will force them to do what they should be doing anyway!